HP Elite x3 aims to meet the requirements of every customer. The latest HP Elite x3 is designed to meet the requirements of every customer thanks to its high-quality features. By adopting a different approach, the company aimed to develop a user-friendly product that would serve as a desktop, laptop, and mobile device. This 3-in-1 model is designed to take user experience to the next level, while it also runs on Window 10 Mobile. More precisely, the company is trying to provide a reliable device for busy consumers who travel a lot and have less access to a desk. That is why the HP Elite x3 is expected to be the ideal tool suited for any work environment. This device comes with a 5.96-inch Super AMOLED display and a 1440 x 2560-pixel resolution backed by a Li-Po 4150 mAh battery which provides up to a 14-hour use of web browsing. Under the hood, it features a quad-core Snapdragon 820 chipset similar with the one in the latest Galaxy S7 Edge. Regarding photo quality, this model has a 16-megapixel rear camera and an 8-megapixel selfie cam as well as a fingerprint and iris scanner for additional security. Besides being 100% dust and water-resistant, the HP Elite x3 is equipped with Corning Gorilla Glass 4. Also, it comes with 64 GB internal storage and 4 GB of RAM, while the internal storage can be expanded up to 256 GB with a MicroSD. Although Windows 10 Mobile has not been the most appreciated option on the smartphone market, it has some solid security features such as enterprise-grade VPN, and Bitlocker encryption. The reason why Windows 10 Mobile lacks popularity is that some apps are not available on Windows phablets including Pinterest, Snapchat, and YouTube just to name a few. While there are still customers that don’t use Snapchat and Pinterest, YouTube is indispensable to every user. 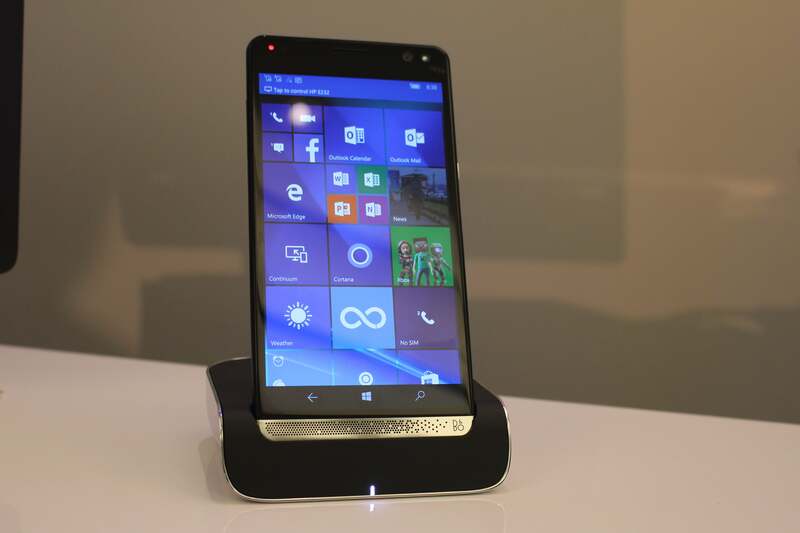 However, the HP Elite x3 comes with a very original feature which is the Desk Dock. This stand enables the x3 to have the same functions of a desktop. Using this accessory, you can connect to an external display, mouse, and keyboard. It is worth mentioning that although you are connected to the Desk Dock, you can still use the HP Elite x3 for text messaging, for example.